How do the best get better? Not easily, that’s how. It takes an amount of work, determination, and skill to get to the top that few can imagine. It takes even more to stay there. With the introduction of the Shoei VFX-EVO Helmet, one of the best in the game has done just that, however. Built to be the absolute best in the off-road world, the Shoei VFX-EVO picks up where it’s predecessor (the Shoei VFX-W Helmet) left off, and that was a pretty high bar. By incorporating a Motion Energy Distribution System (M.E.D.S.) 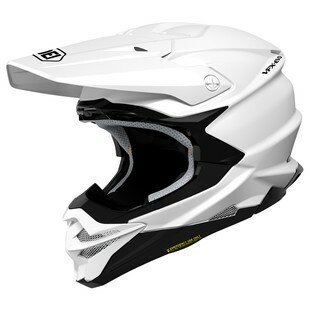 which works to reduce the rotational acceleration to the head that can happen in crash, the VFX-EVO stands as one of the most cutting-edge dirt helmets available. When compared to the VFX-W, the EVO version reduces this rotational force by up to 15%. Additional features include a lightweight Advanced Integrated Matrix Plus shell, premium venting to keep you cool, and precision refined aerodynamics to reduce the pull on your neck over long treks in the saddle. In the end, the simple fact is that Shoei is one of the best helmet makers in the world. They have hit the top of the podium, and now, with the VFX-EVO, they are looking to go even further.